And now we come to the war years of 1939-1945. For the first two years we carried on more or less as usual under the Masterships of Worshipful Brothers George Reginald Plater and Stanley Monks. 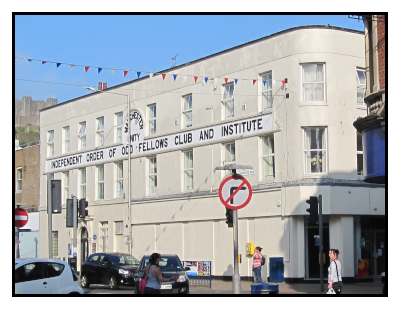 Attendances were small - many members had been obliged to leave Dover (nearly all the schoolmasters) - and towards the end of 1940 we had to vacate our Masonic Hall and meet at the Oddfellows' Club, Pencester Road. We used the facilities here during 1940. We lost our Grand Lodge Officer, Worshipful Brother Felix Dickeson Bolton, Provincial Grand Treasurer in December of this year. Worshipful Brothers Basil Pinto Humphrey, George Reginald Bennett, George Walker Hinchliffe, Percival Arthur Mills and Sydney Ernest Castle successively occupied the Chair until 1945. Difficulties were overcome and the work proceeded. From 1943 we occupied another temporary 'home' - Queen's Head Hotel, Biggin Street. [Click here to view images of the Hotel] Incidentally we made a contribution to the 1940 Festival of £708 and Worshipful Brother Turnpenny was already 'taking steps' for 1950 in spite of his 'accident' concerning which the Lodge offered its sympathy. The 1945 Installation ceremony was carried out at the Royal Victoria Hospital [Dover] when Brother Castle was installed and Worshipful Brother Llewellyn William Charles Langley was appointed Chaplain, becoming Provincial Grand Chaplain the same year. The Lodge is justly proud of those keen members who kept it very much alive during those difficult years. 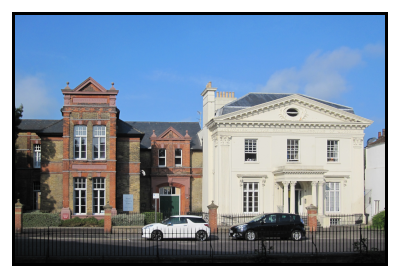 The former Royal Victoria Hospital, now private apartments.